You must make reservations at least 5 minutes in advance of the time at The Tea Room - Windsor Arms Hotel. 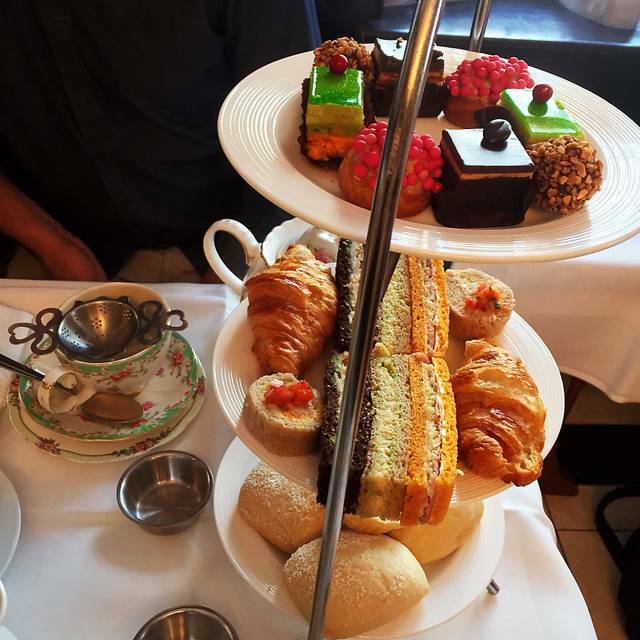 Since 1927, Tea at the Windsor Arms has been synonymous with elegant, afternoon indulgence. 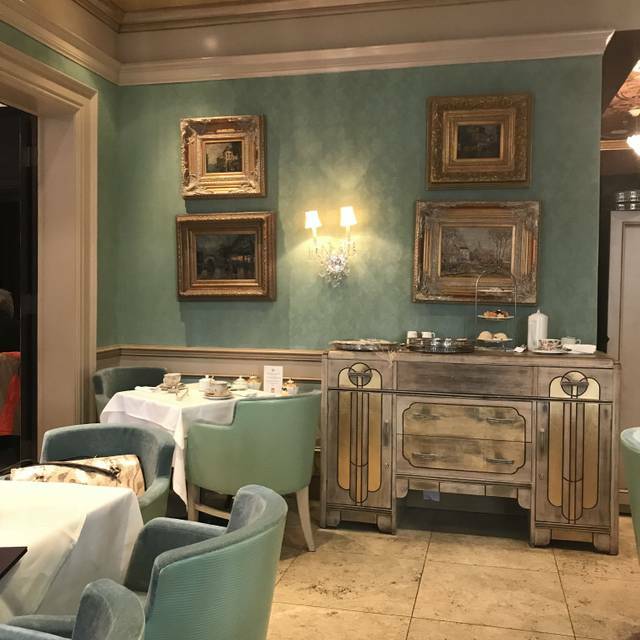 Relax in our French-style lobby tea room or our majestic purple room with its original working fireplace or enjoy your Afternoon Tea behind the red velvet drapes in our Russian Red Tea Room. Peruse a selection of teas from Russian Caravan to Sencha; our staff will happily guide you through the myriad of tastes and aromas. Reserve the Tea Room for intimate gatherings such as corporate functions, bridal and baby showers, or get-togethers with friends. All Tea Rooms are available for either full or partial bookings. Pure Fruit! Apple and Mango, Excellent for Children! Exceptional service. Absolutely delicious scones, desserts and tea. Sandwiches were a bit dry. A lovely place to sit and enjoy company and tea. Such an elegant room and the server was lovely. Room was extremely warm (27.5 celsius) despite us asking the staff to lower the temperature on multiple occasion. They just looked at the thermometer and walked away. It made the experience altogether unpleasant. The food (sweets) was melting on plate as it was so hot. Sandwiches felt like they were prepared too far in advance as they were a bit stale on the outside. Service was so so, we didn't even know what we were eating half the time as they had not told us what anything was. Food was dated and definitely not up to par with other establishment in the city offering high tea. Nothing impressive. Used to be good but has definitely gone down over the years. Afternoon tea was wonderful, attentive servers who service the table sufficiently also allowing you to enjoy your experience. Our server Conor was great and the tea and scones were lovely! it was very nice time for our lady’s party relax. 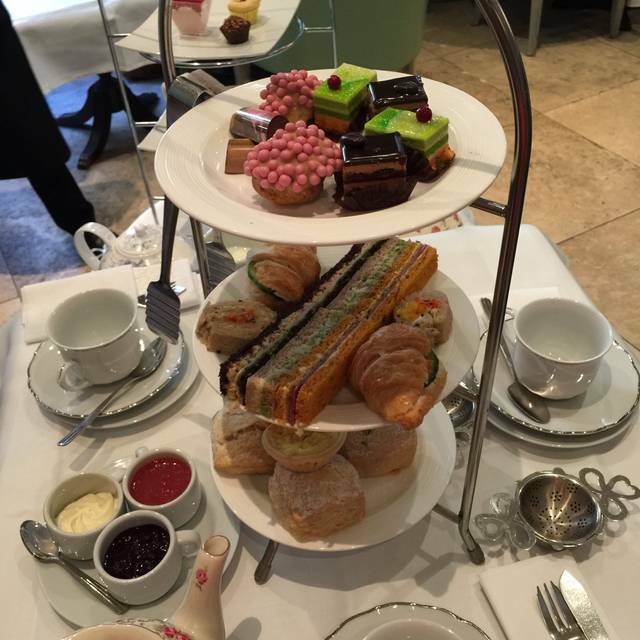 We all enjoy the good service and High quality afternoon tea. I think I will come with the friends who visits Downtown next time. Taken a friend to help celebrate her 70th Birthday. Very happy with the waiter, very knowledgeable, friendly and helpful. The tea rooms are very very nice!! We were nine. The room with the curtain was stuffy and dark. Would have preferred your other rooms. Your jams are too tart. Your scones appear to contain baking soda which makes your mouth pucker with tea. Some of the bread in the sandwiches was quite dry. One scone was too dry. Scones could be smaller to make them more manageable. I had lunch in your restauant the day before with tea and scones for dessert. The scones were lovely and fresh and a good texture. I have had afternoon tea at the Windsor Arms many times over the years. Prefer it to others I have tried, I love the venue but not the room we were in last Sunday. I make my own scones and tea sandwiches. The freshness of bread is very important as is the absence of baking soda in the scones. My scones are light and fluffy. Hope this is helpful. Thank you. Was very accommodating for vegetarians - service was a bit slow but no complaints, we spent more than the two hours since it wasn’t too busy - the tea was really good and the room was lovely. Wish they could let you taste test the teas if you are stuck between two choices. This hotel is lovely like stepping back in time. The ambiance and the service is great. Unfortunately, our server forgot to bring us our teas and finger foods. We had to ask another server for assistance. Maybe he was in training. I would highly recommend this place to anyone looking to escape the modern world. Server was very courteous and polite. We never felt rushed. Elegant and yummy. very good service. I would return. Everything about this high tea is exemplary. The service is superb - unhurried but attentive. 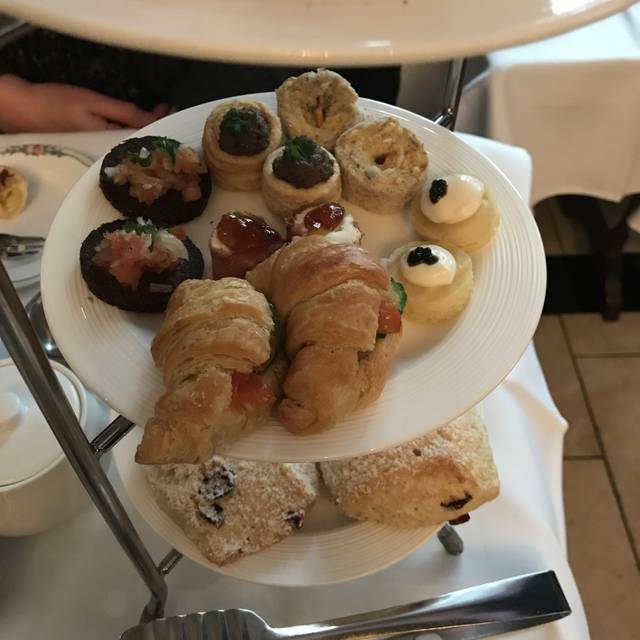 The food is sublime - the best scones I have had in a while, beautifully presented finger sandwiches and the petit fours were lovely as well. I wish the sandwiches were slightly larger and they provided more vegetarian options - but these are minor quibbles. The rooms are beautifully decorated. 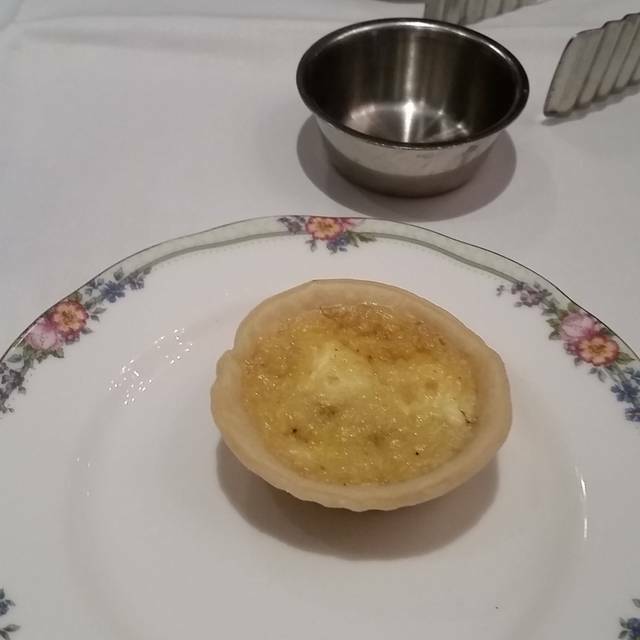 At 50 dollars, this is pricey but not outrageous as that is the going rate for high tea at five star establishments. Another great afternoon at the Windsor Arms. 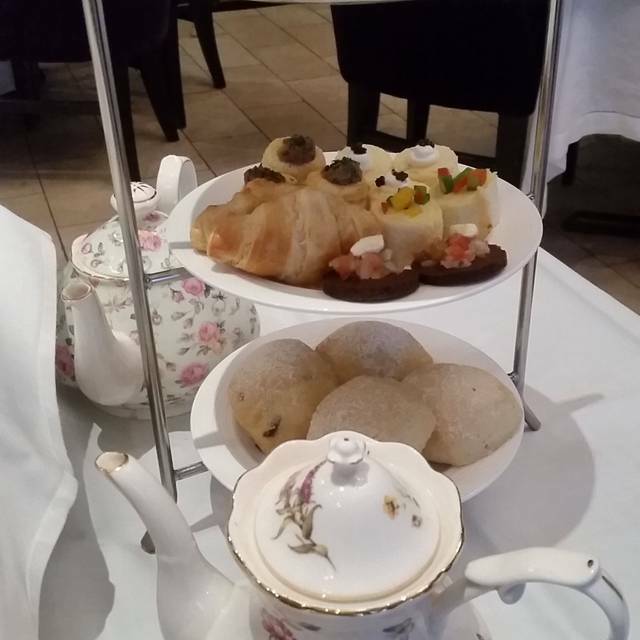 When I think of traditional High Tea, only Windsor Arms pops into mind. Ive been here several times over the past 15 years. The scones are the best around the city, and the cream and jams are a delight. I miss the cucumber sandwiches, but the prosciutto croissant was a new and tasty edition. All in all a nice experience yet again. I have dined at the Windsor Arms tea room many many times over the years and just as others have said it is declining in quality and ambience. The Ritz Carlton is far superior. The service was only so-so, the tea was not piping hot (warm at best), and the food was subpar (the rolled sandwiches were squished and soggy - and the taste also suggested that they were many days old). The scones themselves are still very good, but the preserves are strange and runny, and decanted into espresso cups, which is also strange from a presentation stand point. The most odd part however is that the Christmas decorations (gaudy gold tinselled boughs and a few odd lit wire trees) are still up and the staff said they are now part of the decor! Overall it was a disappointment. Went for my moms birthday. It was very lovely. A little expensive but she enjoyed every minute. On arrival we decided to have a cocktail before we had our tea. Unfortunately our tea came almost immediately so we felt quite rushed. When our food arrived we were taken aback by how uninspired it was. The desserts looked like they were purchased at Costco! The scones which have always been lovely in the past seemed less fresh than they could have been. But......the sandwiches....we had no idea what the fillings were. I think one was supposed to be egg salad but I'm just guessing. I have no idea what the finger sandwiches were other than grey and offputting. By the way I think the napkins had seen their day and ready to be used as dusting clothes. That evening I had stomach cramps but that may have been a result of the exorbitant price. I have been having High Tea there for years......what happened? 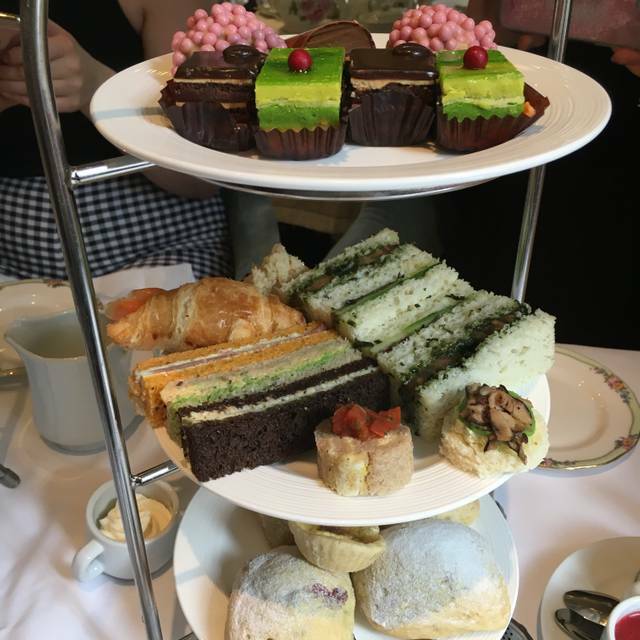 They continue to service the best ‘afternoon tea’ in the city of Toronto. We had a wonderful afternoon. The food & service were amazing and being in the Windsor Arms hotel added to the charm of afternoon tea. Had a great time with my teen daughters. We enjoyed the overall experience. Would go back again! I have been here several times before and had a good experience. This time not as much. Had to ask for water at least 3 times before I got it (near the end). The first advertised tea I asked for was "no longer available; we ran out". My 2nd choice tea was not hot so I had to ask for that to be heated. For the price, the service and food was just okay. Wonderful time celebrating my mother’s 75th Birthday! We reserved a table for 4 at 1:00 on Sunday, March 10/19. Two of us were right on time but the other two were 20 minutes late because we didn't know the streets nearby would be closed for the St. Patrick's Day Parade which for some reason was held a week early. The waiter reminded everyone several times that we were late. He also reminded us several times that he would need the table at 3:00. We had no problem with this at all but didn't need to be reminded constantly. My daughter asked for a couple of substitutes because she just found out that she is pregnant and should not have smoked salmon or cured meats. The waiter again said that most people who want substitutions know ahead of time and because we were so late that this was going to be difficult. Our meal was served and then the waiter disappeared - he never came back to make sure we were enjoying everything. We felt that we were a nuisance. Then, at about 10 minutes before 3:00 he announced that the next party was waiting in the lobby for the table. A fairly disappointing experience - we have been to the Windsor Arms for tea a few times before and have always enjoyed ourselves. Sandwiches and scones were dry! Disappointed with food! Nice but the food is the same every time! Given the small selection, they should change their menu monthly. I would recommend the Team Room to others because of the ambiance and location, however it is expensive so for our next High Tea, we will probably try another venue. Very pleasant experience! Paying more for the ambiance than the food but for a nice occasion it’s lovely! We really enjoying High tea at the Windsor arms!! It was a lovely place with traditional atmosphere! We had amazing service that was personalized, fun and attentive! Very cute spot for Afternoon Tea! Delicious tea and a wonderful atmosphere! Our server Connor was a delight!!! 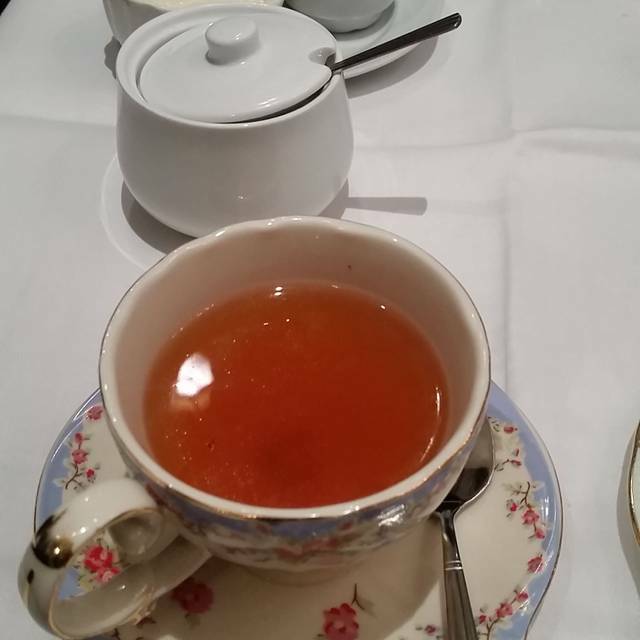 I have never written a bad review before but was so underwhelmed by high tea at the Windsor Arms just had to say something. Will keep it short.....beside the scones( and they are easy to make)the food is well below average ...my mistake for thinking they had higher standards because the price would make you think that. I am kind of at a loss for words for how blah our afternoon was and I am pretty easy to please. Anyway life goes on but feel ripped off. 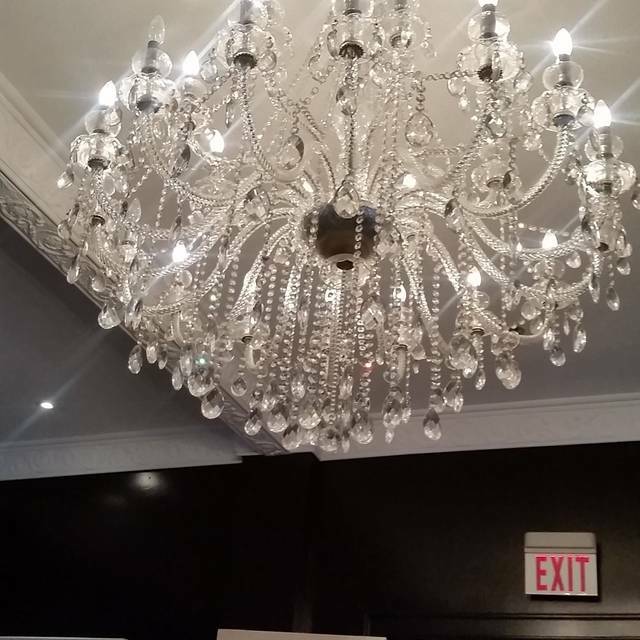 The ambiance was very nice, the service was great but the food quality is really lacking. I"ve been to the Windsor Arms for tea several times and I do believe it's good value for the price. However, this time after 2 hours we were told we had to leave as they had the table booked after us. This is fine but the waiter was really hovering over us and hanging around to make sure we were in fact leaving. I also found the sandwiches a bit dry this time. The tea was great as always and we still had a nice time it just wasn't exceptional .